More and more often anaerobic sludge digestion is the treatment applied to wastewater treatment plant (WWTW/ Sewage Works) sludge. As every wastewater treatment works continually produces a lot of sludge every day, in the course of treating foul sewage, a huge amount of WWTW sludge is generated nationally and internationally. There is now technology available to treat this sludge by anaerobic digestion effectively and reliably, and in doing so the water utility organisations have realised that, not only is their sludge hygienised, but it is also reduced in quantity which also reduces costs in its final disposal. On top of the benefits already stated the anaerobic digestion of WWTW sludge produces enough power to, an many cases, supply at least half of the electricity demand of the WWTW that creates it. So, it is not surprising that so many of these plants are being built or are already in operation. 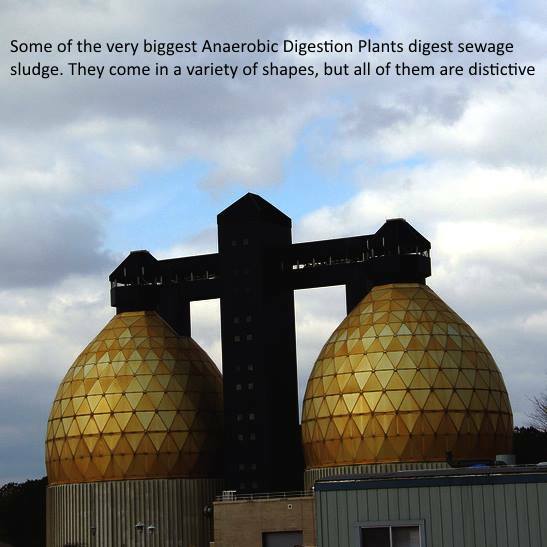 Unlike anaerobic digestion of food waste, sludge produces a much lower biogas yield per unit dry mass volume, and can be slow to produce this gas. The amount of biogas per unit volume of sludge can however be greatly increased by pre-treating the sludge to break up the structure of the sludge cells by adding a further treatment stage before the digester. This is usually done by hydrolysis in which the sludge is heated under pressure for a period of time. Another method is to apply micro-wave radiation within the fermentation tank, to achieve the same result. (d) as type c, but with contents of specified elements below prescribed limits. The purpose of describing the waste sludge in terms of the above classification and placing certain restrictions on the disposal of waste sludge is to minimise nuisances and the transmission of pathogenic organisms either directly to man or indirectly through the food chain, as well as protecting water resources and the environment from pollution. As indicated above, wastewater sludge contains nutrients which can be used beneficially to improve the condition of the soil. Sludge helps to break up heavy clay soils and improves the moisture retaining ability of sandy soils. Although the nitrogen, phosphorus and potassium contents of waste sludges are low compared with the inorganic fertilisers, these nutrients are not leached out as quickly as those from inorganic fertilisers. Sludges derived from domestic waste-water treatment contains trace elements and minor nutrients in relative concentrations that are of the same order as required by most crops. This means that provided reasonable spreading rates are used, one should not experience metal accumulation problems with domestic sludges. However, when industrial effluents are present in the waste-water, significant concentrations of metals and other undesirable constituents may be present in the sludge and it becomes most important to ensure that the spreading rate is such that undesirable concentrations of metals etc, do not accumulate in the soil. After anaerobic sludge digestion, the sludge from sewage treatment (Wastewater Treatment Facilities) contain about 35% organic and about 65% inorganic material. The digested sludge contains about 2.5% nitrogen, about 1% phosphorus and about 0.2% potassium. In addition to these so-called macro-nutrients, the sludge also contains the minor nutrients such as calcium, magnesium, iron, sulphur etc. Depending on the source of the waste-water, the sludge also contains metals such as copper, chromium, nickel, zinc and cadmium. Certain components of the sludge may be advantageously utilised when the sludge is incorporated into agricultural land. In fact, as a result of the organic content and the presence of the nutrients and the trace elements essential for plant growth, sludge is generally valued as a soil conditioner. However, due to the presence of certain contaminants such as heavy metals, viable pathogenic and other organisms and complex organic compounds, careful consideration must be given to its potentially dangerous and hazardous properties when disposing of waste treatment sludge. Where waste sludge cannot be disposed as a soil conditioner, it may be desirable or even necessary to co-dispose the sludge in admixture with refuse on a sanitary landfill site. The co-disposal of refuse and secondary waste-water sludge (in particular digested sludge) in sanitary landfills is being practised in many parts of the world, especially in drier areas which have a perennial water deficit (See Note 1). Note 1: Disposal of sludges to landfill are not permitted any more in the EU member states, as sludge is classified as a liquid under EU rules, and no liquid disposal to landfill is permitted. I had no idea something like sewage sludge could be an interesting subject. Judith Bailey – There is a newsletter subscription form on the homepage if none appears on this page. Many thanks for your interest. Sweet blog! Sadly, we don’t produce much biogas at the present in Hungary, but this can be changing.